Currently the range comprises a total of over 125 different antimicrobial agents and combination tablets. 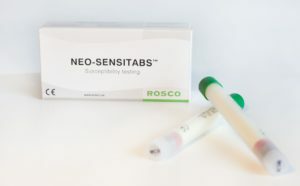 Susceptibility testing with NEO-SENSITABS™ practice is performed according CLSI and EUCAST guidelines. 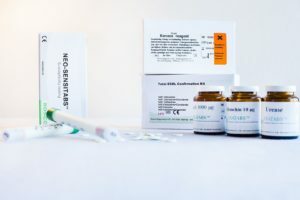 The unique formulation of Neo-Sensitabs also makes it possible to manufacture tablets containing difficult compounds like and still obtain the long-time stability characteristic of Neo-Sensitabs. * A few Neo-Sensitabs need to be stored at 2-8°C. When opened and in use, they are stable at room temperature for up to 2 months. Extensive range – over 125 different antimicrobial agents and combination tablets. Detection of mechanisms of resistance including MRSA, ESBL, AmpC Inducers and Inducible Clindamycin resistance. 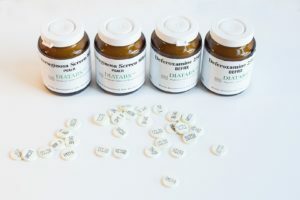 Diatabs offers an accurate and rapid identification of clinically relevant bacteria and yeasts. An extensive range of more than 80 individual tests. Rapid (4 hours) enzymatic and modified conventional test. Detection of natural susceptibility patterns or growth factor requirements. All reagents are packed in box containing 20 ml. Please Click on Read More for more information.